We have all made purchases, which at the time of buying seemed like a good idea. Maybe we saw them on someone else and they looked great, so we thought we would give them a go. Only to find that once home they have sat in the wardrobe unworn. It isn’t that you haven’t tried to wear them, it’s just that you put them on and immediately take them off because something just doesn’t work. So here are 3 wardrobe mistakes and how to remedy them. Problem – The crop trousers that make your legs look short – you love the idea of cropped trousers but somehow they just don’t seem to work on you. Here’s where you may be going wrong. 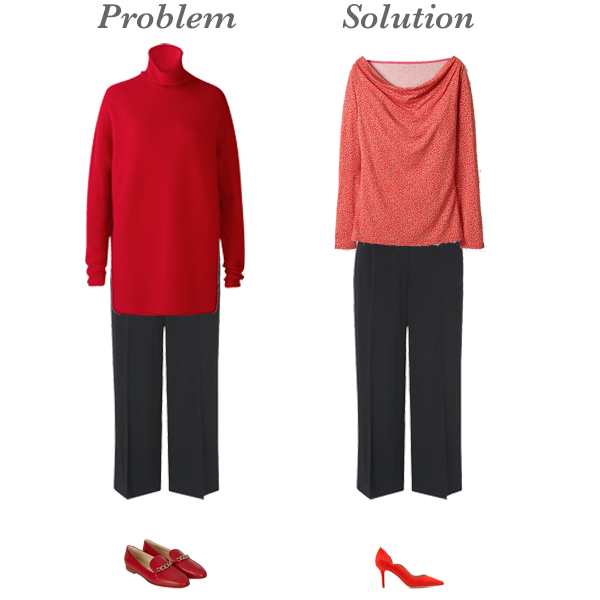 The picture on the left shows the trousers with a long knit and a pair of loafers. Because the trousers are cropped they create a straight line across the leg cutting them off. The long sweater also creates a straight line cutting across the leg. These two things together make the leg look as though it is only as long as the area between the two lines. The solution is a shorter top that makes the leg look longer and a heel which elongates it as well. 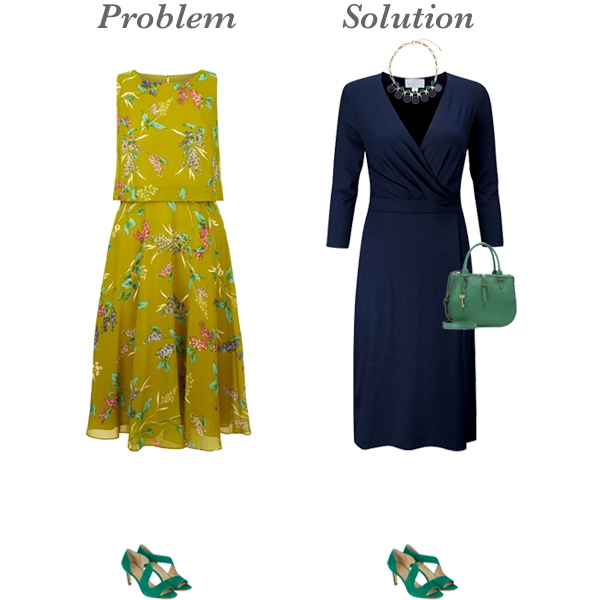 Problem – The shoes you bought for one event that don’t go with anything else – you bought an outfit for a special occasion and the coloured shoes seemed a good idea at the time but you haven’t worn them since. 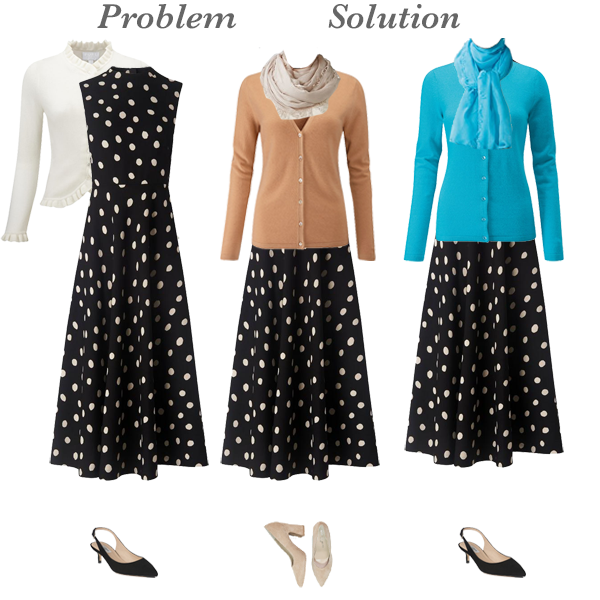 The solution – Good old neutrals! Here is the reason to have a core of neutral items because they go with everything. In this picture I have also added a necklace that includes the emerald colour of the shoes and a bag. Plus what would otherwise be quite a simple navy dress is turned into a far more interesting outfit. Problem – You fell for the “black and white works on everyone” line. But since getting this outfit home you have realised that black and white are too high contrast for you and the black close to your face drains you. The solution – simply add a colour that really works well on you, close to your face. Here I have done a Soft, Light or Warm option in the middle and a Light, Cool or Bright option on the right. Although the black and white would work on a Bright, the bright contrasting colour would look even better. For Deep colouring I’d pep it up a bit with an accent colour, red for example. Remember that you can always try selling on unworn items in your wardrobe. That relieves the guilt a bit and gives you funds for better pieces. However, before you ditch anything, if you liked this post, you may be interested in our new course; The Style Guide, How to Become Your Own Personal Stylist. It includes plenty more tips like this and will show you how to avoid these costly mistakes in the future. Plus it costs less than most of the outfits above!